You've run out of steam&comma; with hours of work ahead of you. Must. Have. Coffee. You’re not alone in your exhaustion&comma; you know. You may not have resorted to napping at work&comma; but if you're like 74 percent of us&comma; you've worked while tired. In a new survey by Accountemps &comma; 31 percent of the finance and accounting professionals who responded said they feel tired very often in the office&comma; and 43 percent said they’re worn out at work somewhat often. Fatigue is to blame for plenty of mistakes on the job—like a $20&comma;000 miscalculation on a purchase order or a missed decimal point causing an overpayment of $1 million. 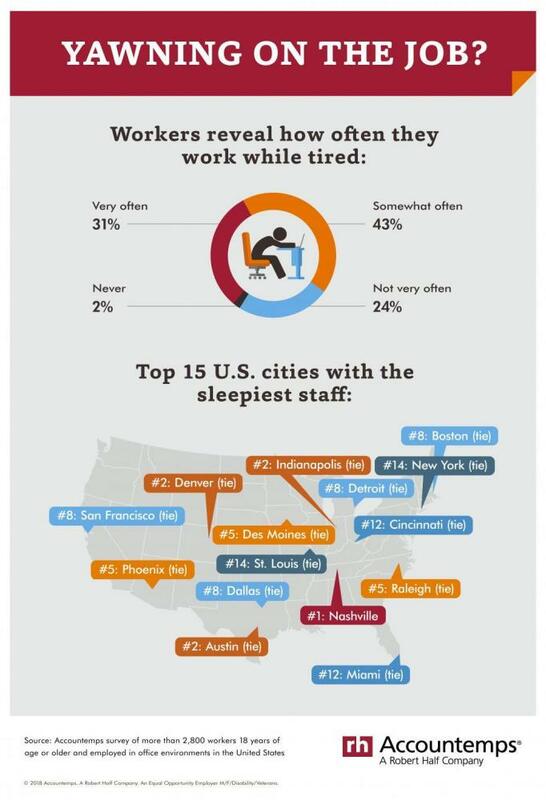 Those were just two lack-of-sleep-induced errors mentioned in another Accountemps survey. One respondent blamed fatigue on an accident that paid everyone twice&comma; and another said sleeplessness led to the deletion of a project that took 1&comma;000 hours to put together. Other side effects of sleep deprivation in the workplace are a lack of focus or distraction&comma; procrastination and grumpiness. It could also lead to retention issues&comma; which is a big issue for companies. If working tired is affecting productivity&comma; not to mention the bottom line&comma; employers would be well-served by stopping the burning of the midnight oil. But how? Make sure you “walk the talk.” Don’t be that manager who tells your finance staff to leave work at 5 p.m. and then sends emails to everyone until midnight. Take occasional breaks yourself&comma; work reasonable hours&comma; and inspire the people around you with your energy and enthusiasm. Evaluate your corporate culture. Emphasize work-life balance&comma; with wellness programs and other incentives. Offer alternative work arrangements&comma; like flextime&comma; remote working or job-sharing options. Encourage regular breaks. Lunch or coffee breaks aren’t required by federal law&comma; but some states impose mandatory rest periods for employees in specific industries. Give time off to unplug. A day off here and there&comma; along with vacation time&comma; can actually boost on-the-job productivity for your staff members. Meet with your team. Spend time with those you manage to evaluate what’s on their plate&comma; help prioritize workloads and set realistic expectations. Make sure they have all of the resources they need to do their work assignments and keep from getting spread too thin. See that the tasks are divided fairly among team members. You may not be ready to encourage napping at work by providing sleeping pods and snooze rooms&comma; but there are ways to cope with the phenomenon of working tired.